I’ve just read a post by Katie Woodger published on her Tumblr blog about an hour ago and it appears that Disney are using a drawing of hers without her permission. In 2010, as part of her graduate work, she drew/painted a lovely piece showing Alice (from Alice in Wonderland) painting roses. It seems lots of people loved it as she actually knows of quite a few who have had it done as a tattoo! 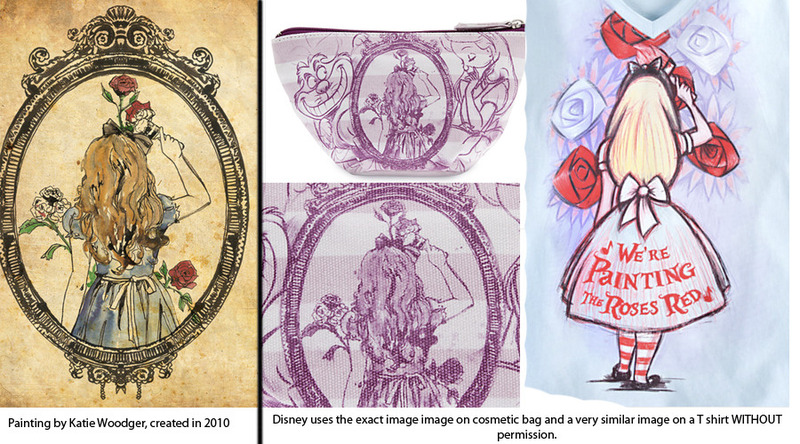 Now, someone has pointed out to her that Disney are actually using the piece on the back of a cosmetics bag – without consulting her at all. A t-shirt design also looks as if it’s heavily based on the work. Katie’s blog post has already set the social networks alight, with people talking about it on Facebook, Twitter and Tumblr. I wonder that Disney’s response will be? It’s possible that Disney have some kind of “rights” to the Alice in Wonderland estate? And so – I really don’t know – but could they claim that anything Alice related is theirs and needs their permission in the first place? Or is it just simply a case of an artwork doing a Google image search and taking a pretty picture they found whilst designing a couple of items? If it is the latter then it’s just another example of how careful you’ve got to be when using information and media you find on the Internet for commercial purposes – basically, don’t do it! You might think no one will notice but it’s surprising how many people will!